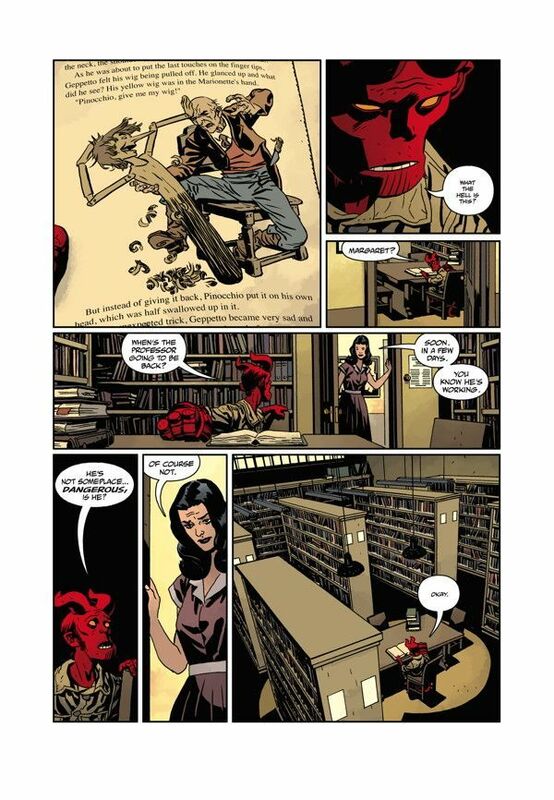 The beauty of a character like Hellboy is that he has such a rich and unexplored history. He's been around since World War II, but we've only seen a fraction of his life so far. Granted, his life on this mortal coil has ended and he's currently in Hell, but fortunately there are opportunities to fill in the gaps of what happened before he passed on. One such story is the original graphic novel The Midnight Circus. 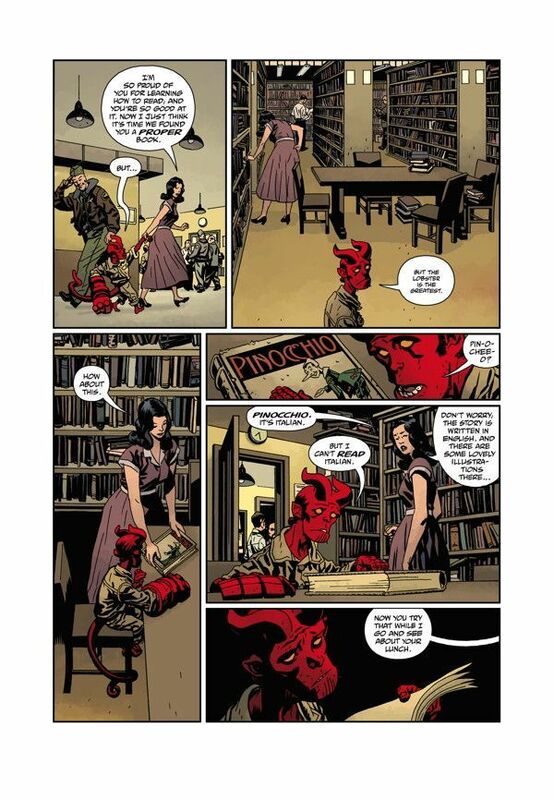 Written by creator Mike Mignola and illustrated by Duncan Fegredo, the comic takes a look at a young Hellboy as he runs away from the B.P.R.D. to see the circus, only it's not your average big top. There are all kinds of spooky stuff going on within those three rings and they're out to get our young hero. First off, Hellboy as a child is friggin' adorable. You can't help but fall instantly in love with the little guy. He's got this janitor's uniform that's been customized to allow for a tail, and his horns are just coming in, so he looks like a small devil. The signature right hand is just as big and intimidating as it would be when he's older and you feel the weight that he carries lugging that thing around as a boy. The Midnight Circus pulls in some aspects of the story of Pinocchio to great success. 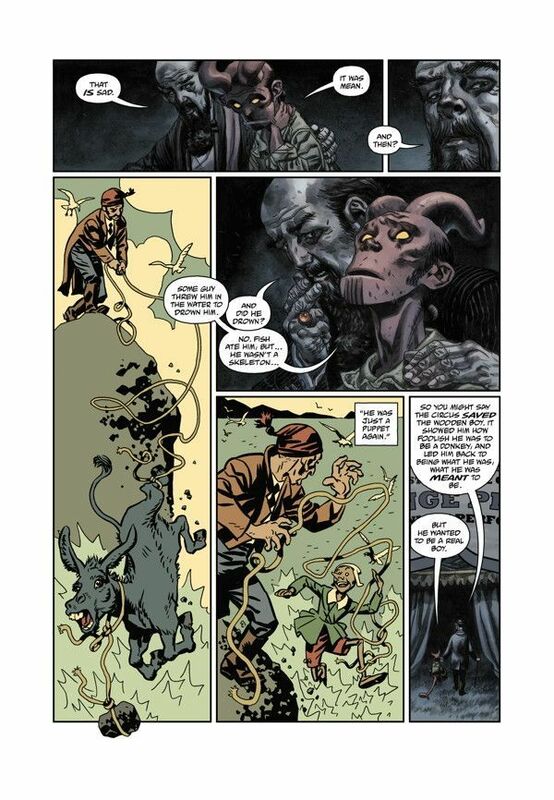 The book is mentioned a few times and it helps Hellboy see through the veil that's cast over him by the ringmaster. It also encapsulates Hellboy's reasons for running away in the first place. He's tired of being cooped up in this stuffy office building all day while professors run tests and poke and prod him. He wants to be a regular boy and go out and play. What better way to do that than to see the circus? This graphic novel (although a short story at only 56 pages) works on two levels when it comes to the terror. You have the inherent creepiness that comes with the circus, which is amplified by the mysterious nature of this particular one that Hellboy visits. You don't want to see what lurks behind some of these curtains. There's a panel where Hellboy is standing in front of a large banner that showcases some of the acts within the circus. They include some basic sideshow attractions such as the Fat Lady and the Tiniest Man, along with some more unsettling ones like the Living Skeleton, The Missing Link, and the Beast-Man. The next level of terror within The Midnight Circus comes from the point of view of Professor Bruttenholm. He's come to care for Hellboy and to view him as a pseudo-son. As a result, the boy's sudden disappearance worries him a great deal and he sets out to find the child at any cost. Hellboy runs out into the world completely naïve of what might be lurking in the shadows. The professor takes it upon himself to bring him back to safety. Duncan Fegredo outdoes himself with the artwork on this title. He manages to alter his style for different scenes to give each location an entirely new look and feel. I had to double check the cover of the book a few times to make sure that he drew all of the artwork because these sections look so unique from one another. 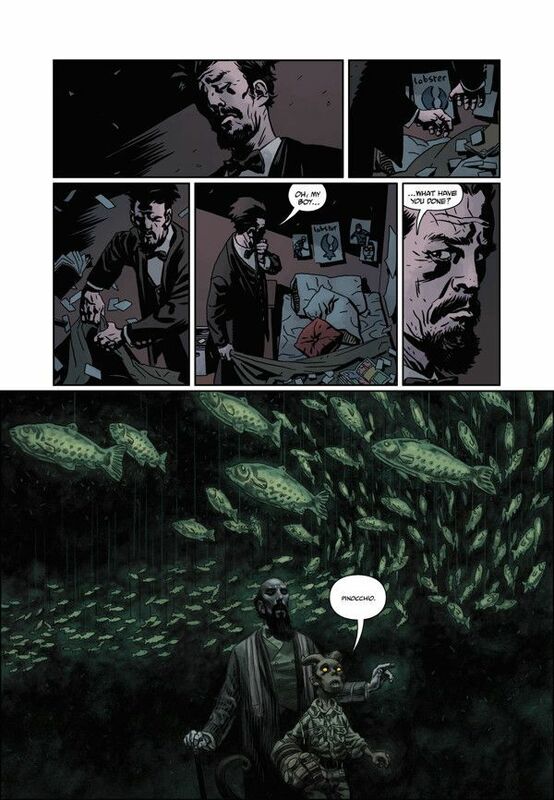 The first few pages look like your regular Hellboy comic, drawn in a style similar to Mike Mignola's. It's a signature of these comics. 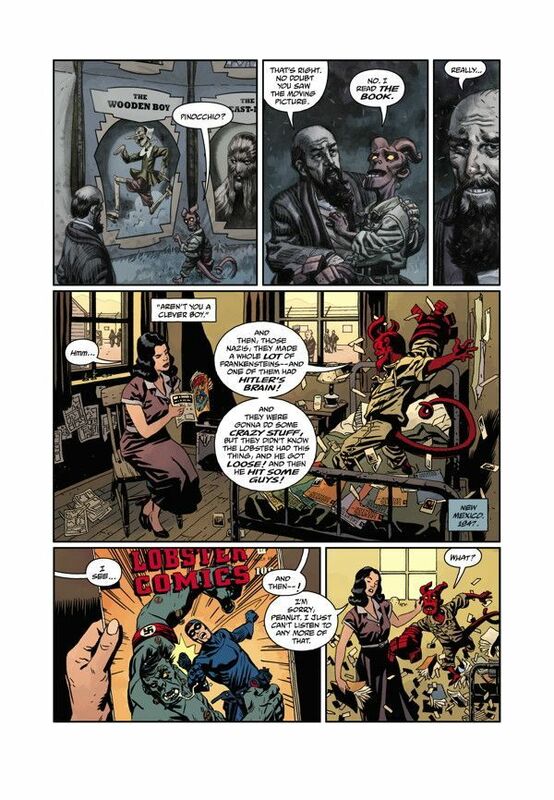 It isn't until Hellboy reaches the circus that things take on an almost dream-like hue. It starts out slowly as the child witnesses a summoning of creatures, parading around to get the show ready. Then once the circus begins, the panels look like they were painted instead of penciled. The characters look simultaneously gorgeous and terrifying. You can't be sure what is going on behind their eyes. A third art style is used for the shots of the Pinocchio story that look more like something you'd expect from an old book like that. Fegredo gets to draw a multitude of odd looking characters in The Midnight Circus, however some of the panel layouts really steal the show away from the people. There are some breathtaking panels that manage to convey the terror that young Hellboy is facing in a matter of moments. The Pinocchio metaphor continues in a literal sense in one scene where Hellboy is in the body of a whale, surrounded by huge ships that have been swallowed up earlier. He looks miniscule at the bottom of the panel while these boats tower over him. Later on, Hellboy is given a glimpse into his possible future, which is something that plagues him throughout his entire life. It's a scary thing to see as a boy, especially if your destiny is to rule an army in Hell. 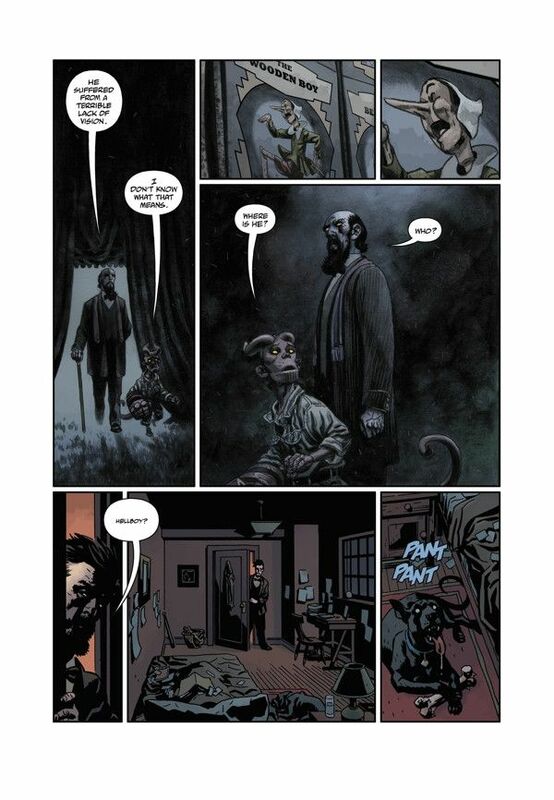 The Midnight Circus is a great addition to the Hellboy mythos. It fills in some of the gaps to provide a little more backstory to the character and how he became the man and the hero later on in life. It also shows how deeply that Professor Bruttenholm cares for the boy in a world where the child is treated as an outcast and a bit of a freak. This is worth checking out for Duncan Fegredo's excellent artwork alone.